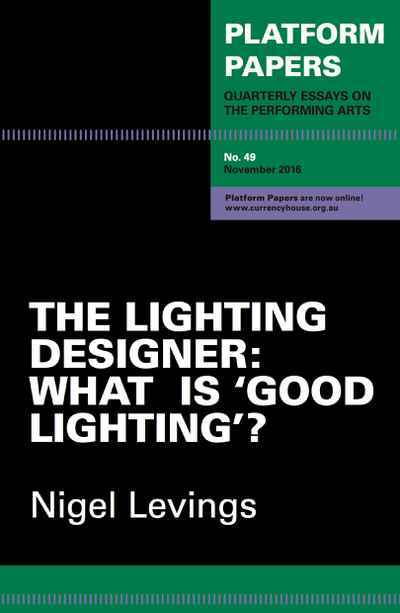 Platform Papers 49 - The Lighting Designer: What is 'Good Lighting'? Lighting for the stage is at its best when it goes unnoticed: when the the actors’ faces are expressive, the costumes look great, the time and mood of the day are eloquent and the changes are imperceptible, writes the eminent lighting designer Nigel Levings, regarded by many as the father of contemporary stage lighting practices. Creative teams hunt in packs, such is the pressure backstage in performance, he says, but lighting designers come late to the team and he prefers to work alone. Good lighting is that which integrates itself into the production and stitches the elements together into a seamless whole. From his long experience in the opera houses of the world he describes how a deep knowledge of the science of light, and fine attention to the elements, can transform a production. Good lighting is intelligent lighting. It springs from deep thought about the text and the director's interpretation of it.